Use one of these free wedding itinerary templates to plan out your wedding day or even your wedding weekend. There are wedding itineraries for planning the day and printable itineraries that can be handed out to the wedding party and even the guests. A wedding itinerary is a wedding planning template that is used to make a list of everything that needs to be done on the wedding day and at what time. It's similar to a wedding countdown schedule but it focuses just on the day of the wedding or the wedding weekend. They also include important information such as names, phone numbers, and addresses. Some of the templates allow you to edit before printing and others have your print and then handwrite in your tasks and times. All of them will help you organize your day and calm those wedding jitters. You'll love how flexible this wedding itinerary template from Confetti is. It's pretty enough to display or hand out to the entire wedding party and anyone who is helping with the big day. Simply print out the timeline, cross off any items you don't need, and then fill in the times of the events. It may also be a good idea to add the names of the people involved in each task. The wedding itinerary template at WeddingWire has you enter your name, fiance's name, wedding date, time of the ceremony, the length of the ceremony, and a few other questions to help you make your timeline. 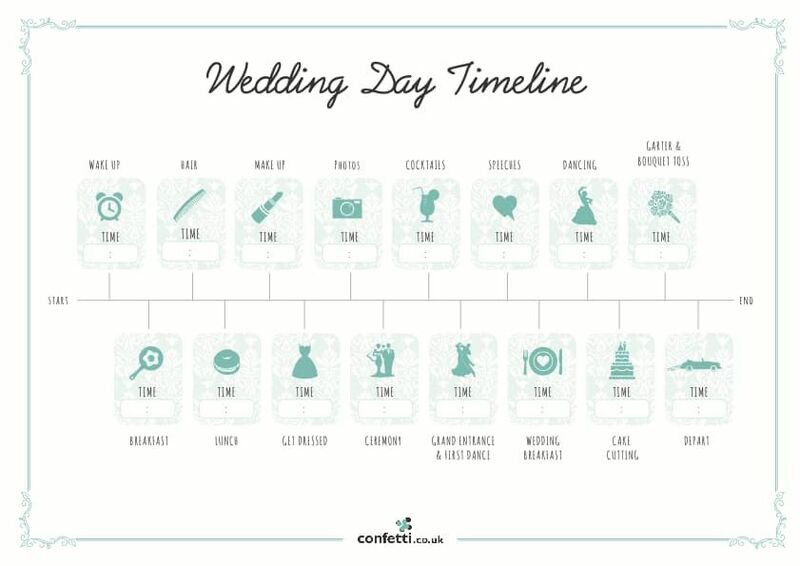 After you've entered all your info, a wedding day timeline will be created for you. You can edit the time and events as well as delete or add your own tasks to the list. After you've customized your wedding itinerary you'll be able to print it and email it. This wedding itinerary template from Wedding Chicks is printed out and then you can add the times of each event. There's room at the top for names and telephone numbers of the coordinator, bride, and groom. There's also space for the ceremony and reception addresses, contact names, and telephone numbers. There are two versions of this wedding schedule you can use, one that includes first look photos and one that doesn't. If you're planning a destination wedding or a full weekend of wedding plans, this is the itinerary for you. It's got room for rehearsal and rehearsal dinner details, the events on the big day, and any other plans for the weekend. This is more of an itinerary you would hand out to the wedding party and other important people in the wedding so they know when and where they're supposed to be. This wedding itinerary is available in DOCX file format which you can open with a word processor or a PDF file you can open with a PDF reader or view in your browser. You can edit the itinerary and change all the text as well as the colors. Here's another weekend wedding itinerary template from Tidy Templates that you can open and edit in a word processing program or PDF reader. This wedding schedule template features blue and green text and a starfish, making it the perfect choice for a tropical destination wedding. You can edit this as much as you want to make it a more detailed schedule or leave it as is so everyone knows what they need to do for the wedding. Word Layouts has created 8 free wedding itinerary templates that either open in a word processor or a spreadsheet program. There are wedding itinerary templates to help the bride or coordinator plan out the timing, visual timelines, a schedule meant to be handed out to the wedding party, and a wedding timeline is pretty enough it can even be handed out to the guests.